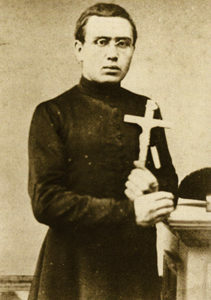 St. Damien of Molokai, was born in rural Belgium, on January 3, 1840. His name was Jozef De Veuster-the youngest of seven children. Upon his oldest brother Pamphile entering the Congregation of the Sacred Hearts of Jesus and Mary, at the age of 13, Joseph quit going to school when his help was needed on the family farm full-time. He helped his family until he was old enough to enter the Congregation of the Sacred Hearts of Jesus and Mary following his older brother and two sisters who took religious vows. There, he took the name Damien, after a sixth century martyr. In 1863, his older brother Pamphile who was given orders to leave for the mission in the Hawaiian Islands, became ill. Damien seized this opportunity and obtained permission from the Superior General to go in his brother’s place. He arrived in Honolulu on March 19, 1864, and was ordained to the priesthood on May 21, 1864. Damien was 23 years old at that time. His first assignment was to the island of Hawaii to begin his pastoral ministry. 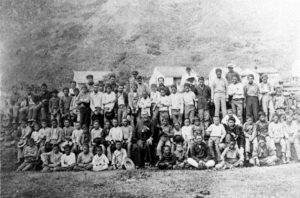 In 1866, Hawaii established a leper colony on the Kalaupapa Peninsula. How leprosy spread was not understood at that time, let alone that most of the population have a built in immunity to it. This lack of knowledge resulted in the forced quarantine of leprosy patients. Fear and ignorance can easily separate us from our sense of humanity. Leprosy was spreading at an epidemic rate in Hawaii amongst the native Hawaiians. There was no Center For Disease Control at that time and the State Board of Health was the state agency responsible for making decisions as to how to handle this rapidly spreading epidemic. The solution to anyone diagnosed with the disease was to send them off to the Kalaupapa peninsula-a piece of land that was perfectly isolated from the rest of the world. This included children. They were young and vulnerable and fell prey to the older and stronger adults there. For nine years, Father Damien worked on the Big Island (Hawaii) as a priest, leading an important, and productive life. Damien remained there for 10 years and accomplished a lot in that decade. During the Holy Week of Easter in 1873, he went to Maui to attend a dedication of a new church. The Bishop was looking for several priests to volunteer going to the Leper Colony on Molokai as there was much work to be done there. The thought was that he would recruit several priests and they would be there on a rotational basis. Damien volunteered and soon, he and the Bishop sailed over to the Kalaupapa Peninsula. He arrived there with just the clothes on his back, his Holy Cross and a breviary (a prayer book). He was supposed to only work in the colony for a limited time, then he would be replaced by one of three other volunteers for the work. But the leper colony was to become his permanent home. After working with the people for a time Father Damien grew attached to the people and his work. He asked permission to stay at the colony to serve. His request was granted. Those that suffer from leprosy often do not have full use of their hands or legs-because leprosy is much like a rotting disease (an oversimplification). Death came almost daily. Those that died were buried in shallow graves because if you are sick, how can you bury a fellow human being if you physically can’t? Father Damien was horrified to witness the wild pigs coming along and uprooting these shallow graves and defiling the bodies that lay there. He vowed that the dead would given proper burials. In the first six years that Damien was at Kalawao on the Kalaupapa peninsula, he dug most of the graves and built most of the coffins for 1,600 people. He built over 300 homes and structures in the 16 years that he was there. Not long after Damien arrived, he soon brought law and order to the population and essentially, became the parent and guardian to the abandoned children that were exiled there. He formed a girl’s choir which became very popular with the residents. Over time, he built a home for the boys and a home for the girls; giving them the shelter and protection that they needed. On a daily basis, Father Damien cleaned and changed the bandages of the lepers. He was horrified that the residents were left to their own with no personnel to give medicine and keep the gaping wounds clean and bandaged. Some patients would have large chunks of their sides or limbs or digits rotted away and full of maggots and infection. The disease of leprosy also affects the nerve endings to the areas of affliction. There is no physical pain that can be sensed in the areas of the disease. He sent many letters to the state and the Diocese to send medical help and supplies along with his continued requests for building materials. Daily, he strove to not only heal their wounds, but their spirits. By 1884, just 11 years after his arrival to the peninsula, Father Damien was diagnosed with leprosy. After he himself contracted the disease in 1885, Damien was able to identify completely with them with the words, “We, Lepers.” Father Damien became a witness of the love of God for His people. His strength came from the Eucharist as he himself wrote: “It is at the foot of the altar that we find the strength we need in our isolation…” It is there that he found for himself and for those he served the support and encouragement, the consolation and the hope that made him “the happiest missionary in the world,” a servant of God and a servant of humanity. 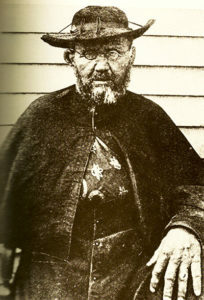 The image pictured above of Father Damien was taken shortly before he died. The photo was taken by Dr. Sidney Swift who felt that it was important to document this man’s death. Shortly before Damien’s death, the doctor arrived at the priest’s rectory with a box full of glass plates and a camera mounted on a tripod. It was this photo of Father Damien that went around the world after he died that became the agent of change that Damien had so hoped for. It was as though in his death, he became the ‘poster child’ for leprosy. It raised public awareness to such a degree that it finally made a difference for the people of Kalaupapa. 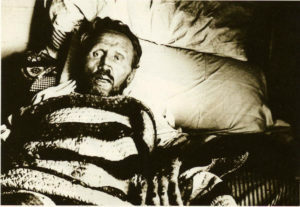 The photo of Father Damien pictured above was taken within two weeks of his death. The photo was taken by William Brigham. Father Damien’s right arm is in a sling made by Mother Marianne from a red silk scarf. It took Mother Marianne just a few months to get from Syracuse, New York to Hawaii, but another 5 years before she arrived to Kalaupapa to help Father Damien. “Look at my hands, all the wounds are healing and the crust is becoming black…I have seen so many lepers die, that I cannot be mistaken. Death is not far off. I have seen visions of the good God calling me to celebrate Easter with Him. May God be blessed for it. ” Father Damien, 1889. The photo above was also taken by William Brigham. If you look closely, his arm is in the sling of the silk scarf that Mother Marianne gave him. Note too, as to how many young boys are residing in Kalaupapa-such young ages to be exiled for life away from your home and family and without any provisions for guardianship. Father Damien died on April 15, 1889, having served sixteen years among the patients with leprosy. His mortal remains were transferred to Belgium in 1936, where he was interred in the crypt of Saint Anthony’s Chapel, the Church of the Congregation of the Sacred Hearts of Jesus and Mary at Louvain. His fame spread to the entire world. In 1938 the process for his beatification was introduced at Malines (Belgium). Pope Paul VI signed the Decree on the “heroics of his virtues” on July 7, 1977. In Father Damien, the Church proposes an example to all those who find sense for their life in the Gospel and who wish to bring the Good News to the poor of our time. Through Damien’s life, we see unending faith, a dedication to vocation and Church, advocacy, a healer, comforter, builder, and compassion. In 1995, Father Damien was beatified by Pope John Paul II in Brussels. On October 11, 2009 Pope Benedict XVI raised Father Damien to the rank of “sainthood.” Saint Damien’s Feast Day is May 10. September 12, 1895: Sacred Hearts Sister Simplicia Hue, near death after suffering seven months from a debilitating intestinal disease, recovers overnight. She had been praying for a cure through the intercession of Father Damien. 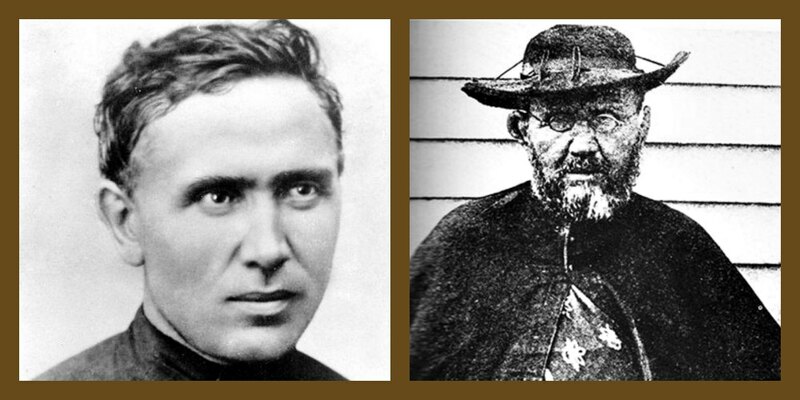 July 7, 1897: Pope Paul VI declares Father Damien “venerable,” the first step toward canonization. December 5, 1991: Father Patrick Bradley, superior general of the Sacred Hearts Fathers, announces that sister Simplicia’s cure has been accepted by the Vatican Medical Commission of the Congregation for the Cause of Saints as a “real miracle,” the primary requirement for beatification, pending papal approval. June 13, 1992: Pope John Paul II officially approves the miracle attributed to Damien. November 3, 1992: Pope John Paul II announces, through the Belgium bishops, that Damien will be beatified in May 1994 in Belgium. March 5, 1993: Father Patrick Bradley announces May 10, 1994 as Blessed Damien’s Feast Day. May 15, 1995: Pope John Paul II beatifies Father Damien de Veuster in Brussels, Belgium. July 3, 2008: Holy Father signs decree confirming that the healing of Audrey Toguchi from cancer is a miracle. Brocker, James H. The Lands of Father Damien, James. H. Brocker, Kaunakakai, HI, 1998. Brocker, James H., Portrait of Molokai, James. H. Brocker, Kaunakakai, HI, 1995. Brown, Pam, Father Damien, Living and Learning, London, 1989. Cahill, Emmett, Yesterday at Kalaupapa, Editions Limited Mutual Publishing, Honolulu, HI, 1990. Daws, Gavan, Holy Man Father Damien of Molokai, Harper and Row, New York, NY, 1973. Office of the Provincial Congregation of the Sacred Hearts, Damien Servant of God, Servant of Humanity, Franciscans of St. Anthony Guild, New Jersey. Stone, Scott C.S., Yesterday in Hawaii A Voyage Through Time, Island Heritage, 2003.